Math Mammoth Grade 4 International Version - description, samples, and purchase info. Math Mammoth Grade 4 International Version is a complete math program for fourth grade. 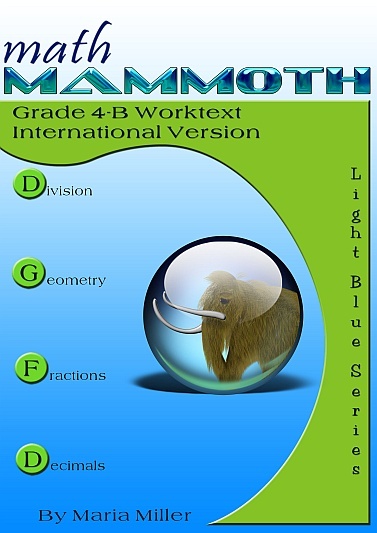 It consists of two student worktexts (A and B), a separate answer key for each, tests, mixed revisions, and in the download version, an additional worksheet maker (Internet access required) to make extra practice worksheets when needed. In money-related word problems, the symbol it used is "$" (dollar). Next come large numbers—up to millions, and the place value concept. At first the student revises thousands and some mental maths with them. Next are presented numbers up to one million, calculations with them, the concept of place value and comparing. In the end of the chapter we find out more about millions and an introduction to multiples of 10, 100, and 1 000. The last chapter in part A is about time, temperature, length, weight, and volume. Students will learn to solve more complex problems using various metric measuring units and to convert between some metric measuring units. In part B, we first study division. The focus is on learning long division and using division in word problems. In geometry, we first revise area and perimeter, and then concentrate on the topic of angles. Students measure and draw angles, solve simple angle problems, and classify triangles according to their angles. They also study parallel and perpendicular lines. When you use these books as your only or main mathematics curriculum, they can be like a "framework," but you do have some liberty in organizing the study schedule. Chapters 1, 2, and 3 should be studied in this order, but you can be flexible with chapters 4 (Time and Measuring) and 6 (Geometry) and schedule them somewhat earlier or later if you so wish. Chapter 3 (Multiplication) needs to be studied before long division in Chapter 5. Many topics from chapters 7 and 8 (Fractions and Decimals) can also be studied earlier in the school year; however finding parts with division should be studied only after mastering division. Please also see the table of contents for 4-A and 4-B (in the sample files), which will let you see the topics covered in more detail. A ruler that measures in centimetres (for 4-A and 4-B). A measuring tape that measures in metres (for 4-A). Fraction manipulatives. The curriculum contains printables to make your own fraction manipulatives. The text uses visual pie models extensively, and students even learn to draw them for themselves in the exercises, therefore making or buying the manipulatives is entirely optional (optional; for 4-B).